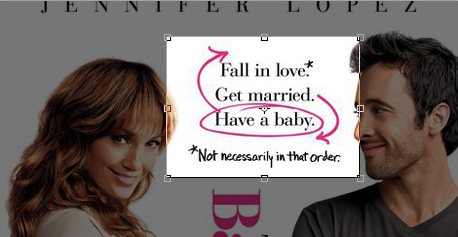 Today we’re looking at the new poster for The Back-up Plan, a romantic comedy about artificial insemination starring Jennifer Lopez and a man with a grey T-shirt. The Back-up Plan is a cut above your average rom-com, and you can tell because the poster is extra-long and therefore extra-sophisticated. There’s nothing women love more than romance, and this poster is more than happy to provide it. Look at the adoring expression on the face of grey-shirt-man: he’d surely do anything for his newfound love. Lopez herself is evidently thrilled with the situation too, but note how she stares at the camera instead of her new beau. This lets the audience know that this is definitely HER MOVIE and for once we’re going to get a comedy that isn’t dominated by male leads. Even if it’s not ‘ha-ha funny’. The rom-com genre might traditionally be the domain of female moviegoers, but in 2010 there’s plenty of space for the menfolk too! The lead man’s strong crossed-arms stance suggests that he’ll be playing a significant and relatable role in the movie, while J-Lo’s improbable posture reminds men that she has a bum which they can look at if they get bored of the endless dialogue. Boy-meets-girl stories don’t cut it any more, and The Back-up Plan knows it. The tagline immediately clues us in to the kooky, unconventional plot-line, while the ‘hand-drawn’ arrows and punctuation reflect the unpredictability of 21st Century relationships. If Knocked Up, Baby Mama, Waitress and Juno didn’t provide you with quite enough pregnancy-based lols, you’ll love all the hilarious mishaps that are sure to arise as J-Lo gets ready to Have Baby.